I'll admit it, I love gossip and I have kept abreast of the escapades of Whitney and Bobby over the years. Bobby Brown has written his memoirs that divulges the intimate details of his relationship with Whitney and some other ladies in show business. I thought it couldn't get much worse than his highly-rated reality series (train wreck) 'Being Bobby Brown,' but he may outdo himself this time. The public has maintained an infatuating love affair with the 39-year-old trouble-prone R&B crooner and his former mega star wife. 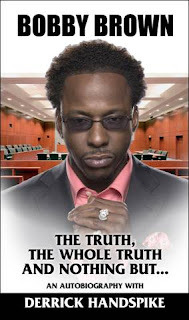 With his latest endeavor, the forthcoming autobiography 'Being Bobby Brown: The Truth and Nothing But ...,' Brown lets loose on an array of controversial subjects, dishes dirt on fellow celebrities and make startling self revelations. In the kiss and tell chronicle Brown will reveal information detailing Whitney and his drug use, marital problems and even admits that she may have married him to dodge rampant rumors of her longtime lesbian relationship with gal pal Robin Crawford. About Janet Jackson, Brown says he never abused alcohol as much as he has until his relationship with the 'Rhythm Nation' singer hit the skids: "I can recall that I started drinking heavily when Janet Jackson and I broke up," he writes. "Before I met Janet I would never drink hard liquor, I only drank beer. But after our break up, I started drinking hard liquor abundantly. I took the way our relationship ended very hard. Not to say we were head over heels in love, but she was someone I had a lot of feelings for. Besides, we were young and naive. I was only about 19 or 20 years old. Young love is no joke!" On Steffans, who is also known as "Superhead" for her admitted sexual acts, Brown was less diplomatic: "Yes, she was a friend of mine. Yes, I've slept with her. Yes, I've spent several nights at her house," he stated point blank, adding, "but she was only good for what her nickname stood for and nothing else ... she is a terrible mother ...If there is one thing I can't stand, that's a woman who is not a mother to her children. That's a big turn-off to me!" Steffans, who blew the bed-sheets off of the hip-hop industry exposing her sexual exploits with some of the biggest names in Black Hollywood via two 'New York Times' best-selling memoirs, has spoken on record about her love for Brown ; her latest book, 'The Vixen Diaries,' has a chapter titled "How To Save a Life, Part Two" where she writes "While the rest of the world continued guessing the nature of my relationship with Bobby, I was working hard to help him be happy, healthy and sane." Bobby Brown thinks otherwise: "To be totally honest, I feel this woman isn't even worth acknowledging," he writes. "I think she is trying to make a quick buck. I also think she needs some psychological help. She has been mentally and emotionally scarred. She needs a hug!" There are less than six degrees between Steffans and Houston; they both have had tumultuous, tabloid-ready relationships with Brown, and also are or were romantically associated with young R&B singer Ray-J who Brown supposedly refers to as "the little guy" throughout his book. Brown admits that he is no angel, alleging “encounters” with many high profile celebrities in the industry, including Holly Robinson-Peete, Madonna, The Real Roxanne, Karyn White, and soap opera veteran, Debbi Morgan. He boasts that “I probably had dated half of the industry, from everybody to everybody…the list goes on from the who’s who to the flava of the month”. He tells all about his cocaine addiction and 2001 heroin overdose. Love him or hate him, he has been able to hold the attention of the public for well over twenty years. I might read the book just to find out what in the world all these women were thinking because frankly I don’t get it…Bobby Brown??? Yeah, sounds to me like he is blaming everybody else for his own failings. He blames Janet Jackson for his drinking and Whitney for his drug use. I don't really like him. I am not very fond of him either. What I can't figure out is what he has that these women are so in love with. He names some quality ladies in his book and I am like WHY? You are right he blames everyone else for his problems.